Flying drones isn’t easy—which is why I recommend a cheap one to start. It gets even harder if you’re trying to control a camera at the same time you’re flying around. But drone pioneer 3D Robotics believes it has a fix: the new 3DR Solo. You just show it what kind of shot you want... and it’ll do the flying for you. I’m not kidding. I couldn’t believe it either. So last week, I drove to the company’s offices in Berkeley, California so I could see this sucker in action. I couldn’t try everything, but I came away impressed anyhow. For 3D Robotics, the Solo represents a lot of firsts. It’s the first 3DR drone that should be totally ready to fly out of the box. It’s the first 3DR drone with a slick, consumer-facing design—from Astro Studios, no less—which should definitely set it apart from the DJI Phantom and its endless parade of drone clones. It’s the first 3DR drone to have a bespoke controller, which comes with a nifty pause button for panic attacks: one tap, and the drone just stops in its tracks. Oh, and it’s got a top-mounted battery bay that could one day hold larger battery packs... a bottom expansion port for accessories as wild an an optical flow sensor (for indoor stability) and a ballistic parachute... and dual ARM Cortex A9 processors inside. Swappable motor pods, too. But the real breakthrough could be what 3D Robotics is calling “Smart Shots”—the ability to record three-dimensional camera maneuvers in midair. The first two Smart Shots are simple enough. There’s “Orbit,” which can have the drone spin around an object while facing it for a 360-degree action shot; and “Selfie,” where you press a button to have the drone back up, up and away. But the real showstopper is “Cable Cam,” where you can literally set waypoints in 3D space—then press a button on a connected phone or tablet to automatically fly between them, recording all the while. You know what else helps with that? 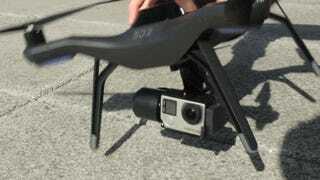 The 3DR Solo is also the first drone to have full control over a GoPro camera. Thanks to an exclusive partnership with GoPro, the Solo can beam down a live feed to a connected smartphone—and from there, to the cloud—while controlling all the GoPro’s settings on the fly from an app. There’s even a micro-HDMI out on the controller to hook up to a monitor or first-person view glasses. Of course, to get the most out of your GoPro, you’ll also want 3DR’s motorized gimbal for stability—an additional $400 purchase. 3DR’s controller was clearly designed with the gimbal in mind. It’s got a special rocker switch on the left to adjust the camera’s angle, two preset buttons on the right to quickly transition between camera modes, and a jog dial that controls how quickly those transitions occur. There’s even an integrated display with readouts for the gimbal’s current position—in addition to this handy phone/tablet holder so you can view live footage. Sounds great, right? Well, hold on to your wallets—this sucker’s going to be expensive. When it ships on May 29th, the Solo will cost $1,000 for the drone and controller alone. No camera, no gimbal, even though the $1,000 DJI Phantom 3 comes with both. 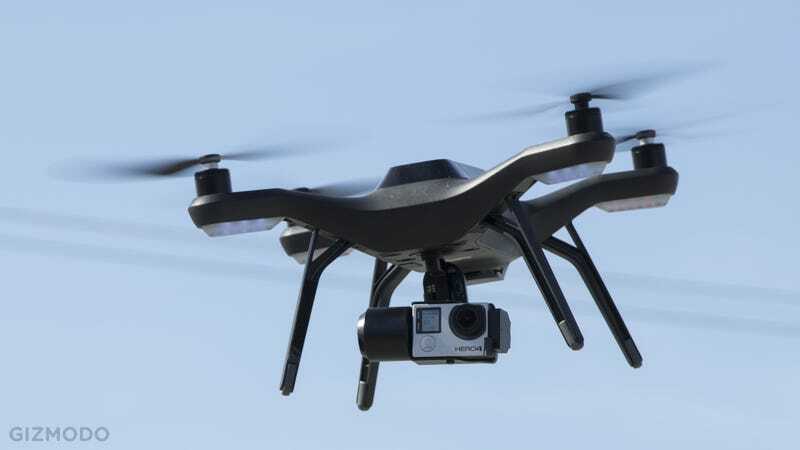 3DR is banking on upgradability to sell the Solo, and it’s not a bad argument. It’s not hard to imagine developers building all kinds of amazing hardware modules and software apps on top of 3D Robotics’ open source platform, and I’m personally salivating over the notion that there might be a drone app store someday. But for that to happen, 3DR will need to sell a whole bunch of drones first. Unless buyers already have GoPro cameras sitting around, or those Smart Shots change the world like I hope, the DJI Phantom 3 may look like the way better deal.